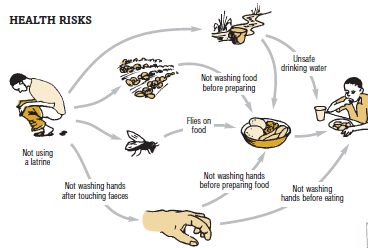 In a post-SHTF world, sanitation and hygiene will be important to keep yourself and your family healthy. Running water may no longer be an option or a healthy choice, and you need to know how to practice good hygiene, proper sanitation and keep your environment healthy. Very important considerations in a SHTF situation. Due to a lack of available medical facilities or treatment, health and disease prevention are going to be more important and more difficult to treat than ever after the TEOTWAWKI. Improper hygiene or a lack of sanitation when you are off the grid is one of the key contributors to hundreds of thousands of deaths throughout the world each year. Although most of these incidents occur in third-world countries, recent history has shown that even in short-term grid-down situations, major sanitation issues can quickly escalate into huge health problems. Combine that with a lack of medical services and you’ve got some serious problems. For example, if the water services shut off and people lose the ability to flush, in a matter of a few days this can quickly turn into a sanitation and health nightmare. This is especially true in the cities where people don’t have other options as far as where to relieve themselves. Sanitation items are easy to gather. You may prefer a pre-assembled emergency kit which already contains necessary items for grooming and sanitation. Because many kit items are sold as a unit, you may find that purchasing a kit is an inexpensive and convenient way to prepare all that you'll need during an emergency. Another option may be to assemble your own emergency kit so you can choose brands or items your family is accustomed to using. Often, you can purchase your favorite brand of soap, toothpaste, shampoo, toilet paper, deodorant and other items in bulk or extra saving packages so you can afford to set some aside for your emergency kit. Toilet Paper When it comes to emergencies, any kind of toilet paper is a luxury. By preparing ahead of time, you can ensure that you don't experience unneeded discomfort by having to get used to a new texture of paper. Also keep in mind that it is common for those in emergency situations to develop stress and diet related stomach problems that can intensify your sanitation difficulties. Toothbrush + Oral Hygiene People with sensitive teeth may want to store their preferred brand of toothbrush in their emergency kit. It is probably a wise idea to store several toothbrushes to give away to someone who neglected to store one. It may also have another useful purpose such as cleaning or scrubbing. Toothpaste, Mouthwash, and Breath Fresheners Emergencies present stressful situations where human communication is crucial. Sometimes water is scarce or unavailable which causes dryness in your mouth. A breath freshener may be a nice addition to your preparedness supplies. Feminine Hygiene Products It is important to be prepared in all areas. These items are definitely important to have available in any emergency situation. Deodorant With several choices of deodorants including anti-perspirants, made-for-a-woman brands, gelled, etc., you may want to decide ahead of time what you'll need during an emergency. Air fresheners or deodorants may also increase your level of comfort during an emergency. Hair Supplies Shampoo, conditioner, hairspray, combs, brushes, and other items may not be necessary for survival, but they can help make an emergency situation more comfortable and clean. Be sure to store smaller sanitation items in your emergency kit and be aware that you can overstuff your emergency kit. If it is too heavy, you may not be able to leave with it during an emergency. Medications for diarrhea, constipation, headaches, allergy and other minor conditions should also be included in kits for added comfort. Laundry Detergent and Soap During some emergencies, you may be required to evacuate the area or may be stranded in some remote area. Because you won't have lots of clothing, you will want detergent to clean your clothes and soap for bathing and for washing utensils. Hand sanitizers are essential to keep in your Bug Out Bag as well. Bathing You can prevent illness by washing your hands often; before eating, after using the bathroom, after you change a diaper, and any other time you may need to freshen up. Because water is such a precious commodity during an emergency, you should remember to use purified drinking water first for drinking, cooking, washing dishes and then for other purposes. Be organized and choose a designated bathing area. If you wash in a river or stream use biodegradable soap and always be aware of others who may be down stream. With a little soap you can also wash yourself in the rain. Other washing alternatives include moist towelettes, a spray bottle, sanitizing lotions, or a wet washcloth. Be sure to wear shoes to prevent parasitic infections and to protect yourself from cuts and puncture wounds that can easily become infected. Sanitation Area Choosing the right location for your sanitation needs is as important as staying clean. Your waste place must be located downhill from any usable water source. It should also be a few hundred feet from any river, stream, or lake. It also helps to have your waste place downwind from your living area, and yet not too far from your camp that the distance discourages people from using it. Luggable Loo With a little preparation, you can have a decent emergency toilet. If you have a medium sized plastic bucket (5-6 gallon), lined with a heavy-duty garbage bag, you have a toilet. Don't forget to add deodorized cat litter to assist with the odor. Make sure you have a lid to cover it. A plastic toilet seat can be purchased to fit on the bucket for a more comfortable seat. If you don’t have an extra plastic bucket available, you can make a latrine by digging a long trench approximately one foot wide and 12 to 18 inches deep and cover as you go. When you dig too deep a latrine it can slow the bacterial breakdown process. The long latrine approach is appropriate for large groups camping in one spot for a long period. Getting Rid of Refuse If you cannot dispose of refuse properly you should always bury biodegradable garbage and human waste to avoid the spread of disease by rats and insects. Dig a pit 12 to 18 inches deep and at least 50 feet but preferably 200 plus feet downhill and away from any well, spring, or water supply. Fill the pit with the refuse and cover with dirt. For back-country hikers, packing out all solid waste is always appropriate, and some authorities at high-use rivers usually require this process. You can make a seat for your latrine by laying logs across the hole, leaving an area open for you to use. After use, cover the waste with small amounts of dirt to decrease the odor. A covered toilet reduces more of the odor than an open one. Make a toilet cover with wood or a large leaf. If the odor becomes unbearable, fill in the latrine completely with dirt and dig a new one. Build a new seat and burn the old wood that you used for the last toilet. Keeping Food Sanitary All food scraps should be either burned or buried in a pit far from your living area to keep bears and other wild animals away from you. Keep all your food covered and off the ground. You may keep your food in a tree, but be sure tree dwelling creatures can’t get into it. Replace all lids on water bottles and other containers immediately after use. Do not wash your dishes in the area where you get your drinking water supply. Instead, wash your dishes away from a stream. Use clean plates or eat out of the original food containers to prevent the spread of germs. Wash and peel all fruits and vegetables before eating. Prepare only as much as will be eaten at each meal. Here is a hygiene and sanitation checklist to get started.